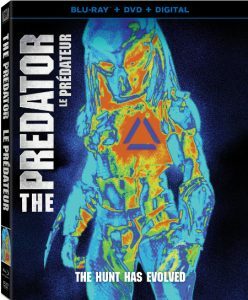 20th Century Fox Home Entertainment annonce pour le 18 décembre 2018, le film The Predator (Le prédateur) en format 4K Ultra HD, Blu-ray et DVD. Réalisé par Shane Black, il met en vedette Boyd Holbrook, Olivia Munn, Trevante Rhodes, Sterling K. Brown, Jacob Tremblay et Keegan-Michael Key. TORONTO, ON – The hunt for the perfect holiday gift is over. The universe’s greatest hunter returns in The Predator on Digital November 27 and 4K Ultra HD, Blu-ray™ and DVD December 18. 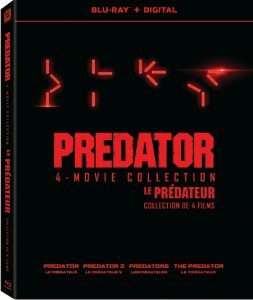 Fans can bring home a special edition Predator 4-Movie Collection, which includes Predator, Predator 2, Predators and The Predator on Blu-ray™. The hunt has evolved – and so has the explosive action – in the next chapter of thePredator series, from director Shane Black (Iron Man 3). Now, the most lethal hunters in the universe are stronger, smarter and deadlier than ever before….and only a ragtag crew of ex-soldiers and an evolutionary biology professor can prevent the end of the human race.